Prepare homemade beer batter. Mix 1 cup of self-rising flour, 2 cups of warm beer, a pinch of salt, pepper and Old Bay Seasoning. Stir with whisk. If batter is too watery, add more flour for thicker texture. Properly clean conch by washing in a solution of lime, salt and water. Be sure to use only the best conch, from the Islands of the Bahamas or Turks and Caicos. Tenderize by pounding conch meat with mallet until meat is shredded. Fry in oil on both sides until light golden brown. Serve with lime and hot peppersauce. Also goes great with Papa Hughie’s Homemade Tartar Sauce. Melt butter in heavy non-reactive saucepan over medium-high heat. Saute onions about 2 minutes, or until soft. Remove from heat, stir in wine and dry mustard. Add remaining ingredients, mixing well. Mixture will be moist, but you should be able to shape into patties. Can be made ahead to this point and refrigerated covered for several hours or overnight. In a medium skillet, melt butter over medium heat. Add shallots, basil, white wine and chicken base. Bring to a simmer and cook 10 minutes, or until wine has just about evaporated. Add tomatoes, seasonings, crabmeat, lobster meat, heavy cream and half-and-half. Bring to boil over medium-high heat, stirring. Reduce heat to medium or medium-low and simmer 30 to 40 minutes or until thickened. Stir frequently. It should be the consistency of lightly whipped cream. Can be made ahead to this point and refrigerated covered for several hours or overnight. Preheat oven to 350°. Cut each shrimp down the back (where the vein was) to the tail, but not through it. Open shrimp out to butterfly them. Press each gently so they lie flat. Mound about 3 tablespoons stuffing down each shrimp. Spray a large baking dish with non-stick cooking spray and place shrimp stuffing side up in a single layer. Bake in center of oven 15 to 20 minutes, or until shrimp are just cooked through and stuffing is piping hot. Meanwhile, if necessary, reheat sauce over low heat. Place 3 stuffed shrimp on each of four warm serving plates and spoon about 1/4 cup sauce over each shrimp. Lightly dust the fillets with flour. In sauté pan, melt butter and add floured fillets. Sauté 3-5 minutes depending on thickness of fish, turn fish, reduce heat to low. Add wine, capers, olives, tomato, fish stock, marinara sauce and water. Reduce sauce. Garnish with a pinch of fresh basil and scallions. Lightly dust the fillets with flour, dip in egg wash. In sauté pan, melt 2 oz. butter and add floured fillets. Sauté 3-5 minutes depending on thickness of fish, turn fish, reduce heat to low. Add wine, fish stock and water. Squeeze in lemon juice. Finish with 1 oz. butter and cook until desired doneness. Crack claws and remove outer shell, leaving meat attached to one side of the claw. 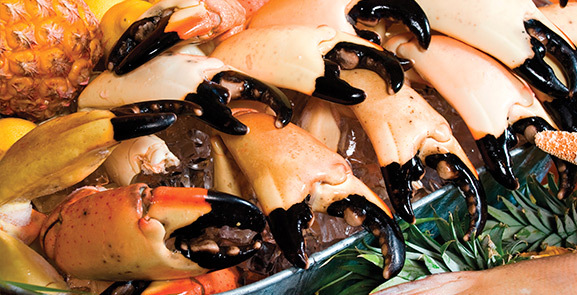 On medium-high heat in a large skillet, combine oil, salt, pepper and stone crab claws. Cook 3-4 minutes or until claws are heated through stirring frequently. Add white wine and lemon juice. Raise the temperature to high and cook 1 minute longer, stirring constantly. Drain. Serve hot or cold as an appetizer or entrée. Heat peanut oil in a frying pan to about 450°. Place a thick tuna steak (about 2 inches thick) into hot oil for about 15 seconds. Flip to other side and cook for about 20 seconds. Remove tuna from pan and sprinkle with toasted white and black sesame seeds. 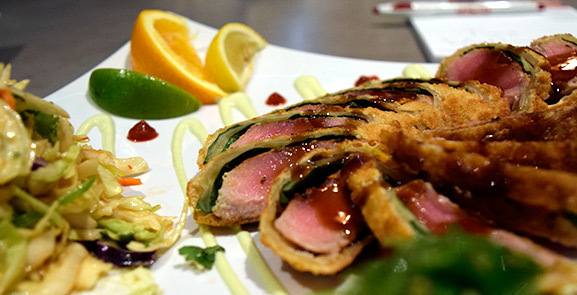 Serve thin slices of the cold tuna with teriyaki sauce, ginger, wasabi, and garnish. Seaweed and calamari salads go great with this dish! Mix ½ cup of blacken spice with ½ cup of whirl to make a paste. Heat a skillet to high heat and cook tuna rubbed or brushed with paste. Flip once and cook no more than medium rare. Serve with ginger teriyaki sauce and garnish with seaweed and calamari salad. Crack claws and remove outer shell leaving meat attached to one side of the claw. On medium-high heat in a large skillet, combine oil, salt, pepper and stone crab claws. Cook 3- 4 minutes or until claws are heated through stirring frequently. Add Homemade Marinara sauce. Raise the temperature to high and cook 1 minute longer, stirring constantly. Drain. Serve hot or cold as an appetizer or entrée.